This Agapanthus was previously known as Agapanthus dyeri. It is an almost mythical agapanthus, very rarely seen in cultivation. It grows in two isolated areas, hundreds of kilometres apart. The flowers are an attractive mid-blue, but light blue forms also exist. The leaves are mainly erect, the tips sometimes bending over. They are 350 x 15 mm. The plant is deciduous, dormant in winter. The flowers, which occur in mid-summer (January to February), are mid-blue and open-faced, becoming pendulous as they open. Light blue flowers have also been noted. The flower stalk is about 0.8 m in height. In cultivation the whole plant becomes more robust and flower stalks can be about 1.6 m tall. Agapanthus inapertus subsp. intermedius is not threatened. Agapanthus inapertus subsp. intermedius is found in the Blaauberg in Limpopo Province and near Namaachas in Mozambique, where it is plentiful. The plants grow in grassland and in between rocks in mountainous terrain, forming large clumps. They occur in summer rainfall areas and would not survive extreme cold. This species was previously called A. dyeri, named after Dr R.A. Dyer, the former Director of the Botanical Research Institute in South Africa (now part of SANBI). The plants were first collected in 1954 on Blaauberg and in 1955 in Mozambique. Leighton in her 1965 publication, The genus Agapanthus L'Heritier, recognized ten species of Agapanthus. Zonneveld & Duncan (2003), who used nuclear DNA content and pollen vitality and colour, recognized that there are only six species. These are A. campanulatus, A. caulescens, A. coddii, A. praecox, A. inapertus and A. africanus. Agapanthus dyeri was found to have the same nuclear DNA amounts as A. inapertus. Agapanthus inapertus subsp. intermedius is pollinated by insects and birds. Seed is dispersed by wind. 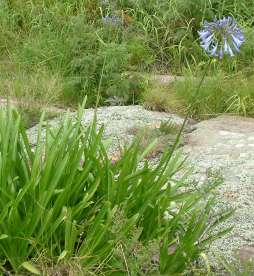 Although some species such as Agapanthus praecox and A. campanulatus are used medicinally, A. inapertus subsp. intermedius does not appear to be used by local people. Grow this agapanthus in a sunny position in fertile, compos-rich soil and water well in spring and summer. It multiplies rapidly and is easy to split. It is best planted at the back of a border because of its tall flower stalks. In cultivation, Agapanthus inapertus subsp. intermedius becomes more robust in growth with large leaves and tall flower stalks. It is an attractive species with its pendulous, open-faced, mid-blue flowers. It also flowers late in the season (January-February) and although it is deciduous, it does not appear to go completely dormant in Cape Town. In a colder climate the plants would become dormant. This plant grows easily from fresh seed. See A. praecox for details of how to grow agapanthus from seed. The leaves are sometimes eaten by caterpillars late in the season and the new growth can also be eaten off by slugs and snails. Duncan, G. 2002. Grow agapanthus. Kirstenbosch Gardening Series. National Botanical Institute, Cape Town. Leighton, F.M. 1965. The genus Agapanthus L'Heritier. Journal of South African Botany, Suppl. Vol. No. 4.